The time for me to go home again to race my hometown triathlon is here again. 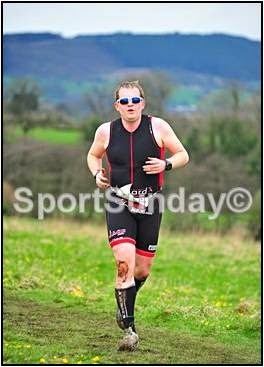 When I left home at 18 I didn’t appreciate or understand the awesomeness of multisport or even know about the existence of triathlon but I find it important to race in my hometown as Clitheroe still holds some fond memories for me. Being able to run past the tree where my Mum’s ashes are scattered ahead of the race is poignant and makes me truly appreciate how far I have come on this journey. And yes it still makes me feel like I have a brussel sprout stuck in my throat. But enough of that. Let’s get down to the nitty gritty of the race. It’s fair to say that I completely underestimated the amount of climbing involved in last year's rendition of the Clitheroe Triathlon. Yes I’d seen the course profile but I didn’t know how steep a 16% climb was. Between the steepness of the climb, having a herd of sheep stampeding towards me and torrential rain. I was relived to limp home in 2 hours and 17 minutes. This year I knew what to expect. On checking the weather it again looked problematic but thankfully come race morning the skies looked to be fine. No torrential rain like last year however there had been overnight. Given I haven’t been swimming much I was a little worried that my estimated swim time of 6:20 may prove difficult to achieve. I waited to be set off on my 400m swim and set myself a target of bridging the 40 second gap to the swimmer ahead. I felt really good in the water and on my 14th length had caught the swimmer ahead. This gave me two lengths to go with clear water and I exited the water and made the 80m jog to transition. It was during this jog that I first appreciated how boggy the ground was. The chip time for my swim and jog to T1 was 6:12 which I was really pleased with. Was it swimming in front of my family, swimming in my old pool or just mental prep that had resulted in this fast swim for me? Who knows but I was elated. Now for my nemesis on this course, the bike. It isn’t easy lugging nigh on 15 stone up hills. The profile for Clitheroe is something not to be underestimated like I did last year. There is 1400ft of climbing in 30km with a 16% climb. Now if like me you live in the flatlands of Doncaster then these numbers are frankly frightening. At the start of the ride I felt like I had no power at all. This could have something to do with there being a steady climb for the first 5 miles. I was being overtaken by a couple of people on this climb but was steadily gaining ground on the competitor in front of me. When I reached the bottom of Jeffrey Hill, last year came flooding back to me. My failure of having to walk up this hill as I couldn’t settle on the bike and find traction was in the back of my mind. I vowed I would not fail this year. So I started to climb and I was feeling really strong. I was ignoring my ever increasing heart rate and was soon gaining on the rider in front of me. This would surely be the slowest overtake known to man. I mean who overtakes up a 16% climb. Well it turns out I do. My HR peaked at 188bpm as I made it to the top of the steepest section. I was smashed but I had done it. There was a shallower climb to the top of Jeffrey Hill still to come and when I crested this I knew I would come into my element. As much as I struggle with climbing due to my weight, I excel at going downhill, gravity is my worst enemy and best friend. On the descent I flew past three riders and maxed out at 38mph. I love going downhill. Now onto the run. I hoped the boggyness of the transition area was not a sign of things to come but given I had seen people caked in mud, I suspect the run would be extremely muddy. It turns out I was right. It was the toughest conditions I have ever run in as far as underfoot conditions go. In the first lap I slipped over twice with no damage done apart form to my pride and getting a bit muddy. I saw my family at the end of lap one and they laughed at how muddy I was. My new shiny trisuit complete with logos of the companies who've helped me and now holes. About 0.5 miles into lap two however it all went a bit wrong. My shoes were caked in mud and had no traction and on a gravelly bit of the course everything went a bit well er....... sideways as I hit the ground with the force of a small elephant. On getting up three local kids asked “Are you alright Mister?” What could I say to that? “I’m fine” was my response but I was anything but fine. I had grazed my leg, knee, hip and arm, stung my back and side on nettles and I still had 1.5 miles to run through. It turns out I also ripped my shiny new printed trisuit. So run on we did ignoring the pain in my ankle where I turned it in the fall. It was not pretty or comfortable but I got the job done. I’d left T2 after 1:20:00 and thought I had a 36 minute run in me which would mean a sub 2 hour time for this triathlon, which was what I had targeted. But after my fall my pace slowed considerably. I ended up posting a 42 minute run for the 4.2 miles which meant my finish time was 2:01:48. I was a little disheartened but that is still a 16 minute improvement on last year and given the horrendous conditions on the run I can’t really complain. I am fitter, faster and stronger than I was a year ago and that is what counts. When I got to the finish they had to check if my knee needed first aid as it resembled something from a horror movie. The blood had flowed from my knee and covered my calf guard. Apart form the cut to my knee I was injury free. Next stop Desford Triathlon where #Rinnie gets her first outing.